In a piston-engine, propeller-driven airplane, thrust is proportional to rpm, manifold pressure, and propeller blade angle, with manifold pressure being the most dominant factor. At a constant rpm, thrust is proportional to throttle lever position. In a jet engine, however, thrust is quite disproportional to thrust lever position. This is an important difference that the pilot transitioning into jet-powered airplanes must become accustomed to. On a jet engine, thrust is proportional to rpm (mass flow) and temperature (fuel/air ratio). These are matched and a further variation of thrust results from the compressor efficiency at varying rpm. The jet engine is most efficient at high rpm, where the engine is designed to be operated most of the time. 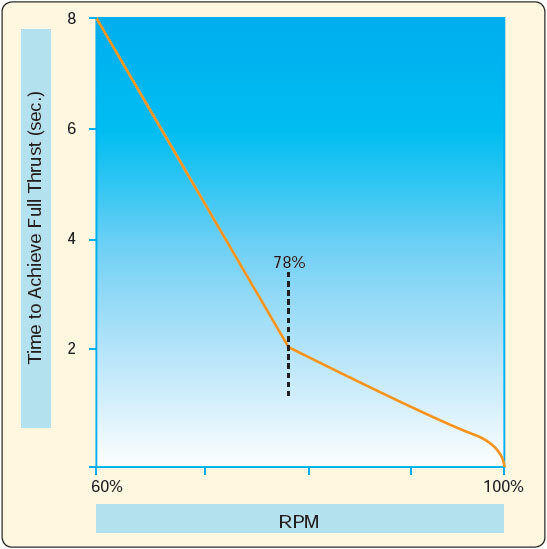 As rpm increases, mass flow, temperature, and efficiency also increase. Therefore, much more thrust is produced per increment of throttle movement near the top of the range than near the bottom. One thing that seems different to the piston pilot transitioning into jet-powered airplanes is the rather large amount of thrust lever movement between the flight idle position and full power as compared to the small amount of movement of the throttle in the piston engine. For instance, an inch of throttle movement on a piston may be worth 400 horsepower wherever the throttle may be. On a jet, an inch of thrust lever movement at a low rpm may be worth only 200 pounds of thrust, but at a high rpm that same inch of movement might amount to closer to 2,000 pounds of thrust. Because of this, in a situation where significantly more thrust is needed and the jet engine is at low rpm, it does not do much good to merely “inch the thrust lever forward.” Substantial thrust lever movement is in order. This is not to say that rough or abrupt thrust lever action is standard operating procedure. If the power setting is already high, it may take only a small amount of movement. However, there are two characteristics of the jet engine that work against the normal habits of the piston-engine pilot. One is the variation of thrust with rpm, and the other is the relatively slow acceleration of the jet engine. Figure 15-6. 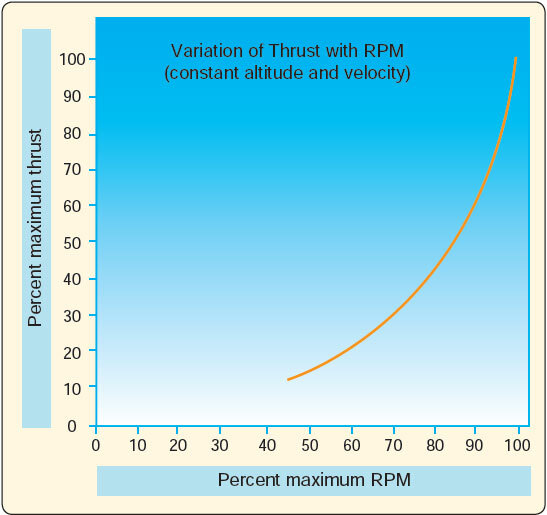 Variation of thrust with rpm. In a propeller-driven airplane, the constant speed propeller keeps the engine turning at a constant rpm within the governing range, and power is changed by varying the manifold pressure. Acceleration of the piston from idle to full power is relatively rapid, somewhere on the order of 3 to 4 seconds. The acceleration on the different jet engines can vary considerably, but it is usually much slower. Figure 15-7. Typical jet engine acceleration times. Even though engine acceleration is nearly instantaneous after about 78 percent rpm, total time to accelerate from idle rpm to full power may take as much as 8 seconds. For this reason, most jets are operated at a relatively high rpm during the final approach to landing or at any other time that immediate power may be needed. Maximum operating altitudes for general aviation turbojet airplanes now reach 51,000 feet. The efficiency of the jet engine at high-altitudes is the primary reason for operating in the high-altitude environment. The specific fuel consumption of jet engines decreases as the outside air temperature decreases for constant engine rpm and true airspeed (TAS). Thus, by flying at a high altitude, the pilot is able to operate at flight levels where fuel economy is best and with the most advantageous cruise speed. For efficiency, jet airplanes are typically operated at high altitudes where cruise is usually very close to rpm or EGT limits. At high altitudes, little excess thrust may be available for maneuvering. Therefore, it is often impossible for the jet airplane to climb and turn simultaneously, and all maneuvering must be accomplished within the limits of available thrust and without sacrificing stability and controllability.